The American Board of Internal Medicine (ABIM) offers the Internal Medicine Exam for certification purposes. Becoming certified shows that a candidate has met the high-level criteria required in this profession. Candidates must meet specific academic and work experience eligibility requirements before taking this test. The content of the test is approximately broken down as follows: cardiovascular disease (14%); gastroenterology (9%); pulmonary disease (10%); infectious disease (9%); rheumatology/orthopedics (8%); endocrinology/metabolism (8%); oncology (7%); hematology (6%); nephrology/urology (6%); allergy/immunology (3%); psychiatry (4%); neurology (4%); dermatology (4%); obstetrics/gynecology (3%); ophthalmology (2%); otorhinolaryngology (2%); miscellaneous (1%). Candidates will need to demonstrate your knowledge in these cross-content areas: critical care medicine (10%); geriatric medicine (10%); prevention (6%); women’s health (6%); clinical epidemiology (3%); ethics (3%); nutrition (3%); palliative/end-of-life care (3%); adolescent medicine (2%); occupational medicine (2%); patient safety (2%); substance abuse (2%). This computer-based test was created with multiple-choice items. Most of the items are based on patient encounters for which candidates will be required to demonstrate an ability to make high-level decisions. Since the final result is based on how many questions are answered correctly, it is better to try to answer every question. The results will be given as a pass or fail. Once a candidate passes, the certification will be good for 10 years. 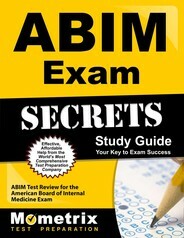 Ace the ABIM test using our ABIM exam study guide with practice questions. 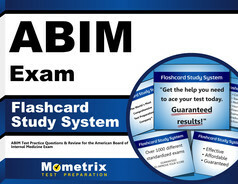 Quickly Solve Difficult ABIM Test Questions with the ABIM Flashcard Study System.